- WWF Saturday Night's Main Event #28 (September 18, '90) = Tugboat & Hulk Hogan won, via DQ, over Rhythm & Blues. - WWF Survivor Series '90 (November 22) = Tugboat, Hulk Hogan, Jim Duggan & the Big Boss Man fought in an "Elimination" Match against Dino Bravo, Earthquake, Haku & the Barbarian. Tugboat was counted out. Hogan was the sole 'survivor'. - WWF Royal Rumble '91 (January 19) = Tugboat competed in the Royal Rumble, which was won by Hulk Hogan. - WWF The Main Event V (January 28, '91) = Tugboat & Hulk Hogan defeated Dino Bravo & Earthquake. 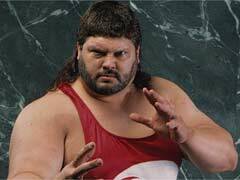 - WWF At The Omni (May 3, '91) = Tugboat pinned Colonel Mustafa. 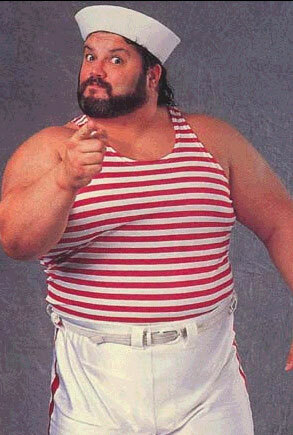 - WWF Saturday Night's Main Event #28 (April 15, '91) = Tugboat competed in a "Battle Royal", which was won by Mr. Perfect. - SWS Sumo Hall (June 7, '91) = Tugboat beat Roadblock. 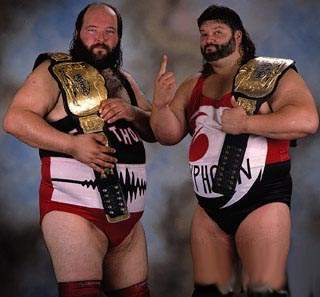 - WWF Summerslam '91 (August 26) = The Natural Disasters (Typhoon & Earthquake) defeated the Bushwhackers. - WWF at Royal Albert Hall (October 3, '91) = Typhoon competed in a "Battle Royal", which was won by Davey Boy Smith. - WWF Survivor Series '91 (November 28) = The Natural Disasters & Irwin R. Schyster fought in an "Elimination" Match against the Big Boss Man & the Legion of Doom. Typhoon was eliminated by Hawk. The Legion of Doom "survived". - SWS Tokyo Dome (December 12, '91) = The Natural Disasters lost to the WWF Tag-Team Champions, the Legion of Doom. - WWF At The Omni (January 5, '92) = The Natural Disasters were beaten by the Legion of Doom. - WWF Royal Rumble '92 (January 19) = The Natural Disasters won, via countout, over the WWF Tag Champs, the Legion of Doom. - WWF Wrestlemania VIII (April 5, '92) = The Natural Disasters won, via countout, over the WWF Tag-Team Champions, Money Inc.
- WWF Summerslam '92 (August 29) = The Natural Disasters retained the WWF Tag Titles, beating the Beverly Brothers. - WWF Survivor Series '92 (November 25) = The Natural Disasters & the Nasty Boys fought in a "Tag-Team Elimination" Match against the Beverly Brothers & Money Inc. The Natural Disasters "survived". - WWF Royal Rumble '93 (January 24) = Typhoon competed in the Royal Rumble, which was won by Yokozuna. - WWF UK Rampage '93 (April 11) = Typhoon pinned the Brooklyn Brawler. - WCW Halloween Havoc '93 (October 24) = The Shockmaster, Charlie Norris & Ice Train won over Harlem Heat & the Equalizer. - WCW BattleBowl (November 20, '93) = The Shockmaster & Paul Orndorff defeated Ricky Steamboat & Steven Regal. Later on, the Shockmaster competed in the "Winners Battle Royal", which was won by Vader. - WCW Fall Brawl '93 (September 19) = The Shockmaster, Sting, Dustin Rhodes & Davey Boy Smith won a "Wargames" Match over Sid Vicious, Vader & Harlem Heat. - WCW At The Omni (October 3, '93) = The Shockmaster & Dustin Rhodes took down Harlem Heat. - WCW Clash of the Champions XXV (November 10, '93) = The Shockmaster beat the Equalizer. - WCW Starrcade '93 (December 27) = The Shockmaster won over King Kong. - WWF Wrestlemania X-7 (April 1, '01) = Tugboat competed in the "Gimmick Battle Royal", which was won by the Iron Sheik.